The hermit thrush (Catharus guttatus) is a medium-sized North American thrush. It is not very closely related to the other North American migrant species of Catharus, but rather to the Mexican russet nightingale-thrush. Adults are mainly brown on the upperparts, with reddish tails. The underparts are white with dark spots on the breast and grey or brownish flanks. They have pink legs and a white eye ring. Birds in the east are more olive-brown on the upperparts; western birds are more grey-brown. Their breeding habitat is coniferous or mixed woods across Canada, Alaska, and the northeastern and western United States. They make a cup nest on the ground or relatively low in a tree. 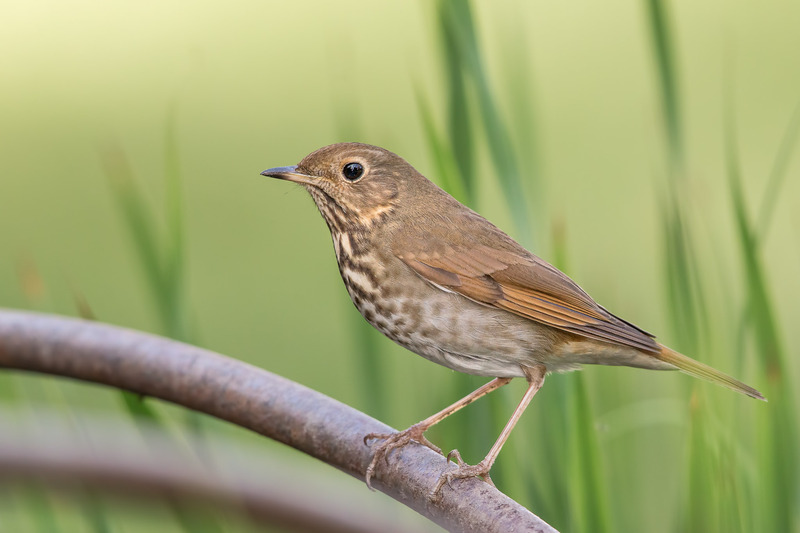 Hermit thrushes migrate to wintering grounds in the southern United States and south to Central America but some remain in northern coastal US states and southern Ontario. Although they usually only breed in forests, hermit thrushes will sometimes winter in parks and wooded suburban neighbourhoods. They are very rare vagrants to western Europe. It has also occurred as a vagrant in northeast Asia.